Why a bill of sale ? Homepage Need a V5 Registration Document ? Why a bill of sale ? 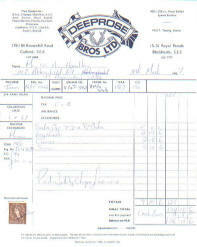 The original bill of sale is almost as useful as an old log book. It will usually show the make, model, engine capacity, frame number and registration number as well as confirming the age of the bike. What can I provide ? What I need from you. Why a tax disc ?